It’s been a while since we’ve heard anything about the NFL that didn’t involve concussions, criminal behavior or angry tweets from the president. 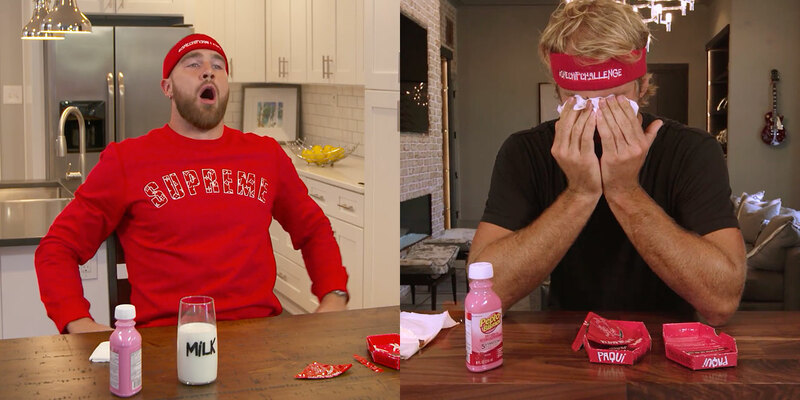 In fact, this video of Travis Kelce and Greg Olsen challenging each other to eat one of Paqui’s hellishly spicy Carolina Reaper Madness chips is probably the most positive media coverage we’ve seen about professional football in months. The chip is named after its chief ingredient, the Carolina Reaper pepper, which happens to be the world’s spiciest pepper. This year’s batch of chips is even hotter than last year’s, and individually sold in coffin-shaped boxes that ask if the purchaser has any last words. And here we thought hot sauces led the race in ominous packaging. Which brings us to the video, made by Olson Engage. The two pro tight ends challenge each other to eat one of the chips, with milk and Pepto-Bismol on hand in case things get ugly. Which they do. Also, watching Kelce shun a glass of milk while choking on his own acid reflux is proof that one can never underestimate how petty performative masculinity can get. Milk-shaming was only cool when Lemmy did it. If any of our readers feel like making yourselves cry, you can order a chip from Paqui’s website while supplies last.